This drive system utilizes a hydraulic jack and wire rope system to raise and lower the elevator car. It's very quiet, and smooth. The Inclinator Hydraulic Elevette offers a smooth, quiet ride with a 750lb. and 950 lb. capacity. The Elevette comes in custom sizes up to 15 sq. 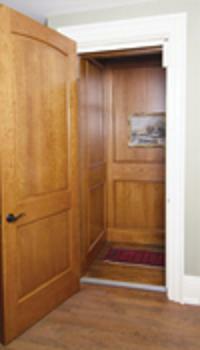 ft. with door openings on 1, 2, or 3 sides. 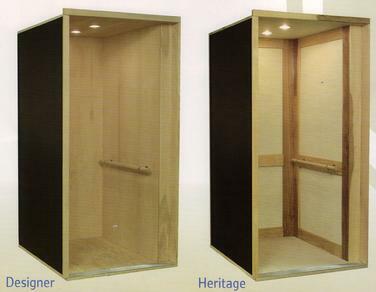 Each elevator is hand crafted to your specific design. 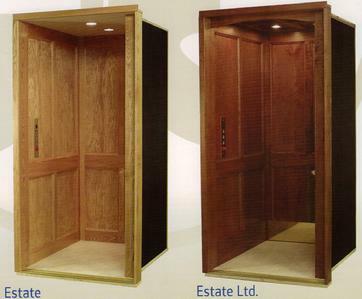 There are more Elevette elevators in homes across the country than any other brand. Inclinator has been in business since 1923. The Elevette can be installed in a shaft or in an "open" environment - running up the center of open winding stairs, next to stairways and where no stairs exist (check your local codes). 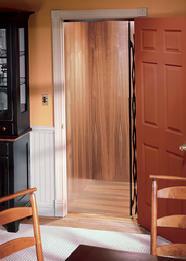 Just about any wood species available can be used in your Elevette interior. You also get to pick your lights, handrails, and flooring. 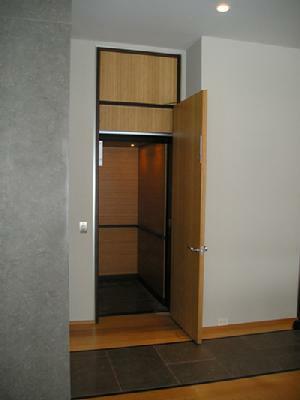 The Elevette comes with standard safety features such as an overrun switch, instantaneous dual cable safeties, key lockout, gate safety switch which will stop the elevator if the gate is opened while the car is in motion, interlocks which keep the doors locked and closed while the car is in motion. 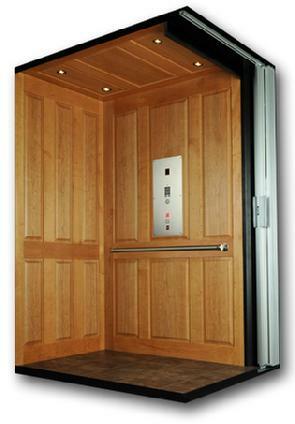 Roped hydraulic elevator with a 1000 lb. capacity, it can travel up to 50' feet at 40 fpm (feet per minute) and have up to 5 stops. The car size can be a maximum of 15 sq ft. Automatic opening accordion gates are a unique and handy feature. 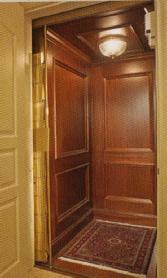 Roped hydraulic elevator with a 950 lb. capacity, travels up to 50' feet at 40 fpm and can have up to 5 stops. The car size can be a maximum of 15 sq. ft.
Automatic opening accordion gates are also standard on this model. 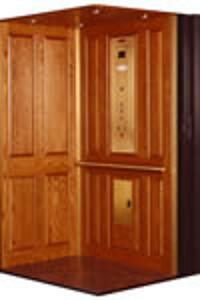 The Elvoron HR can greatly enhance the livability of all levels of your home now and in the future. It is available in a wide variety of colors and finishes, ranging from contemporary materials to the classic warmth of wood cabinetry. Safe, reliable, stylish, and easy to use. The Elvoron design team selected only heavy duty structural components and well-proven drive and control system to ensure safety, comfort, and long term reliability. The Elvoron HR is a 1000 lb. 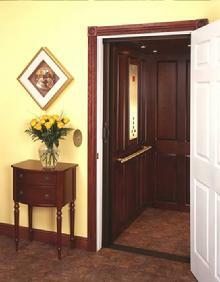 capacity elevator that travels at 40 fpm and can travel up to 50'. has a 1000 lb. capacity, can travel up to 50' feet, with up to 5 stops, and travels at 36 fpm. The cab can be customized to fit your needs. 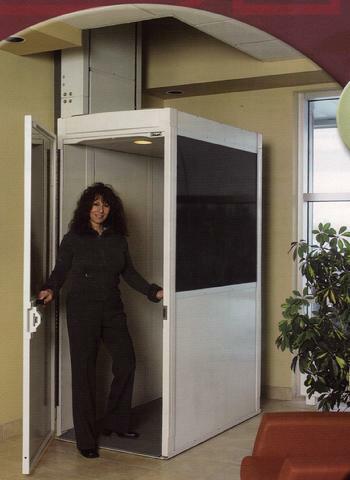 The Savarria Telecab has a 500 lb. weight capacity, maximum travel of 23'ft at 25 fpm with a roped hydraulic system. Safety features are an adjustable top floor presence detector built into the cab, electro-mechanical door lock and open door sensor, under panel safety sensor, emergency stop and alarm, emergency battery lowering and manual emergency lowering. The cab is equipped with clear or bronze acrylic windows, two halogen lights in cab, and a telephone in the cab. 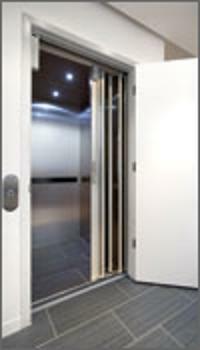 Elevators designed and manufactured with commercial grade components for high trafic use. If you can dream it then Cambridge can build it.